Located in Section 17, the stall is managed by a young chap called Julian Cheng. D.F ordered two bowls of dried beef noodles – one with tripe for Shum and without tripe for me. 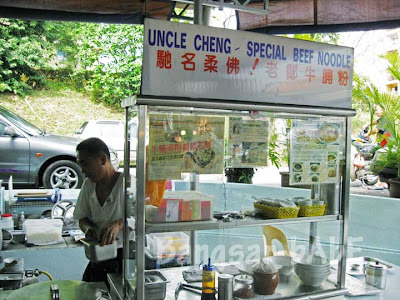 He also added dried beef slices (RM 2.50) in our noodles. This version of beef noodle is different from Ngau Kee’s. 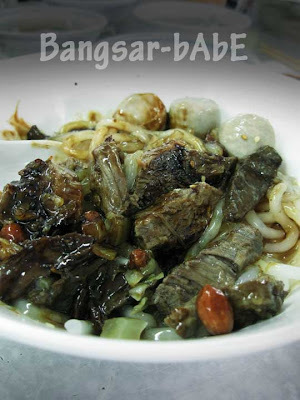 The beef noodle here is the Johor type. 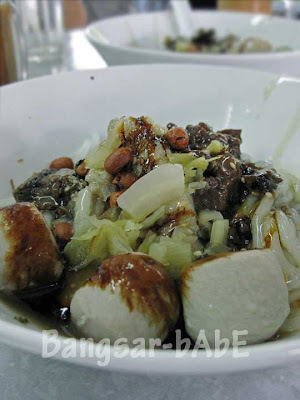 Instead of minced beef sauce we’re accustomed to, the lai fun comes with with beef slices, tripe and beef balls. And garnished with sesame seeds, char choy and peanuts. Slightly starchy, sweetish and thick, the sauce went well with the lai fun. 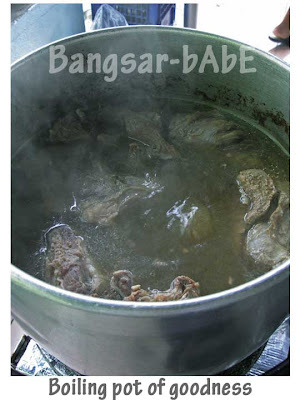 The beef slices, especially the dried ones (marinated in dark sauce) were tender and rich in flavour. 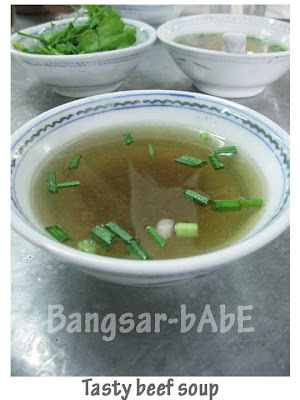 A bowl (only one size) costs RM6, and can go up to RM10 per bowl with additional “liu”. Not exactly cheap, but the beef is of good quality. The beef balls had a good springy texture and the clear beef broth was kau and nice; so good that I had to have a refill. The noodles were decent, but I would prefer it to be beef-ier. That aside, it was a hearty bowl of beef noodles. He’s also known for his Bone Marrow soup, but you’ll have to order that in advance. I will definitely try the beef soup noodles the next time I go! Verdict: Considering location and cleanliness, I’d choose this beef noodles over Ngau Kee’s. i remember that this was quite the place to go for beef noodles..thanks for the reminder haha, havent gone about to eat this! I thought yr bowl of noodles looked really beefy – but still not beefy enough for you?! Loads of beefy goodies there wor. 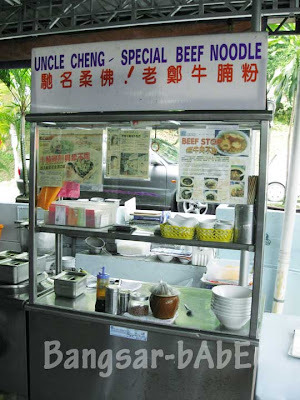 Uncle Cheng moved to 54, Jalan SS2/4A, Petaling Jaya. This is the worst place on earth. I just wanted to try the so called “best beef noodles”. The first time I went I was not assure of Julian’s behavior. I didn’t know what to order and he told me ” the way you look like your gonna choose the cheapest one. He called me a cheapskate directly to my face. I just didn’t want to say anything so I just ignored it. A few weeks later, I decided to give it a go again. I went there and I ordered for the first dish on the menu and Julian’s wife told me ” ya you wanna order the cheapest one.” And she asked for my drink I ask for chinese tea and she said “ya cheapest one again”. “Julian” and his wife insulted me 2 times by calling me a cheapskate. The beef noodles i ate tasted extremely sour and it was not good at all because it was all made by his Myanmar worker. Please do change your attitude, stop looking down on people and calling people cheapskate and please keep up quality with your food. If you don’t change it I think your going in the wrong direction. Rule no 1 of business is customer satisfaction if you can’t even achieve that you should not even be running a noodle stall. All the viewers which are reading this please be aware about “Julian and his wife’s behavior” then you will understand how I feel. This guy is sic. After two mouthful, i found a life insect in my noodles. Instead of saying sorry, he rudely says ask god why there is an insect and wants to charge me.. When I refuse to pay since I stop eating after I found the insect, he shouted insult that I went to his shop and has no money to pay.. Not in my life will I ever go near..